Info "Tilt to avoid hitting your neighbor. This is also called neighborly love." When in Rome… is one of Dribble and Spitz's Microgames in WarioWare: Smooth Moves. 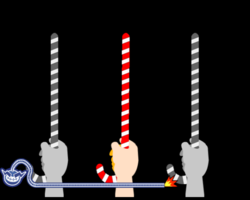 The title may be a possible reference to the old phrase "When in Rome, do as the Romans"
The player has to prevent the object from touching the others by tilting it so that it moves with the others. 1st level difficulty: "The Umbrella" form has to be used to avoid the canes (they are replaced with lightsabers in the Japanese version). 2nd level difficulty: "The Janitor" form has to be used to avoid the dogs. 3rd level difficulty: "The Mohawk" form has to be used to avoid the genies. ↑ ノンケねねし. (June 2, 2016). #8 おどるメイドインワリオ実況プレイ【ねねし実況】. YouTube. Retrieved December 19, 2018. This page was last edited on December 19, 2018, at 16:34.